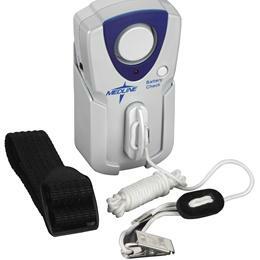 Medline'S Magnetic Alarm: Inhibit Patient Wandering With This Efficient Alarm. The Magnetic Pull Switch Releases From Any Angle, Eliminating False Alarms And Clothing Tears. Mounts On Bed Or Chair. Tether Clips To Patient'S Clothing. Recessed On/Off Switch On Side Of Alarm. Battery Check Button Allows Caregiver To Check Batteries Without Sounding Alarm. Uses 2 Aaa Batteries (Included). Battery Cover Securely Fastened With Screws. Adjustable Cord. Includes Strap, Cradle And Hook And Loop Fastener For Mounting. 2 Aaa Batteries (Included). Advantage Magnetic Alarm. Item Sold By The Each.